Newbury Racecourse in Berkshire is conveniently situated in the centre of the South of England, easily accessible from Junctions 12 and 13 of the M4, from the M3 and A34. The Racecourse has its own railway station with full details on available services below. Sat navs use the postcode RG14 7PN for the easiest access route on racedays. Please follow our yellow event day signage and accompanying brown signs which will bring you to our site. Once you arrive our traffic team will direct you to where you need to park. Please see the site map below which outlines the new road layout or scroll down to see our location on Google Maps. The new road bridge is now permanently open, allowing access to the Main Racecourse Reception, Car Parks 2 and 4 and Nuffield Health on non-racedays. Please note that there is no through access to or from Car Park 1 or Stroud Green. 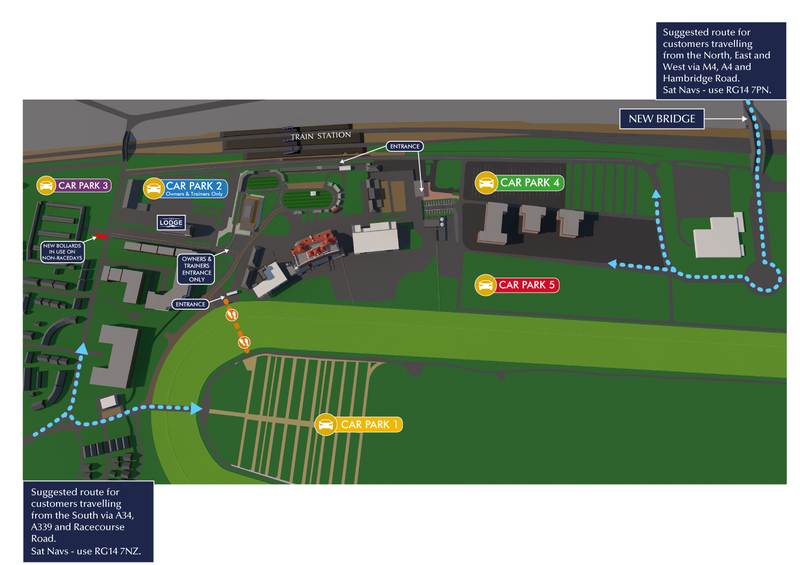 For customers arriving for events on non-racedays, your route will depend on the Car Park you have been allocated. Please visit our Events page for more information. Please see our full postcode below.